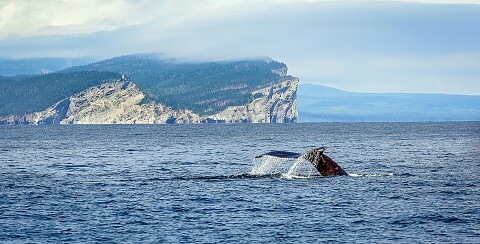 Discover, with Croisières Baie de Gaspé, one of Quebec's hidden treasures - the large whales of Forillon National Park! 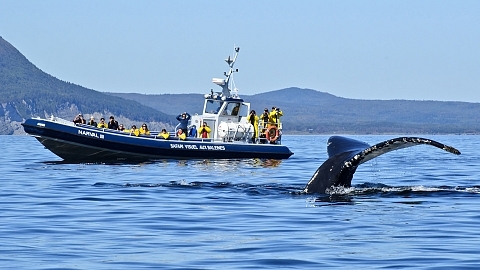 Throughout the season, depending on the food available, as many as 6 different species can be seen in the waters of Gaspe Bay and the Gulf of St. Lawrence such as the Blue (The largest whale in the world), and the spectacular Humpback whale. 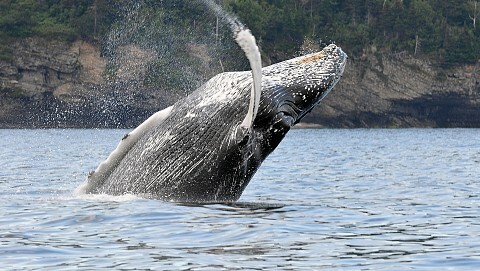 Forillon is the best site in the province of Quebec to observe the big whales. The scenic panorama of Forillon National Park’s south shore unfolds before your eyes as you journey from the Grande-Grave heritage site to Cap-Gaspe where the renowned “Old Man” (the Vieux) stands watch at the easternmost tip of the long Appalachian Range. Schedule: June 9 to October 10, 2019. Time of departure: one to four departures daily. Marine mammals observation, geology, history and interpretive guide.